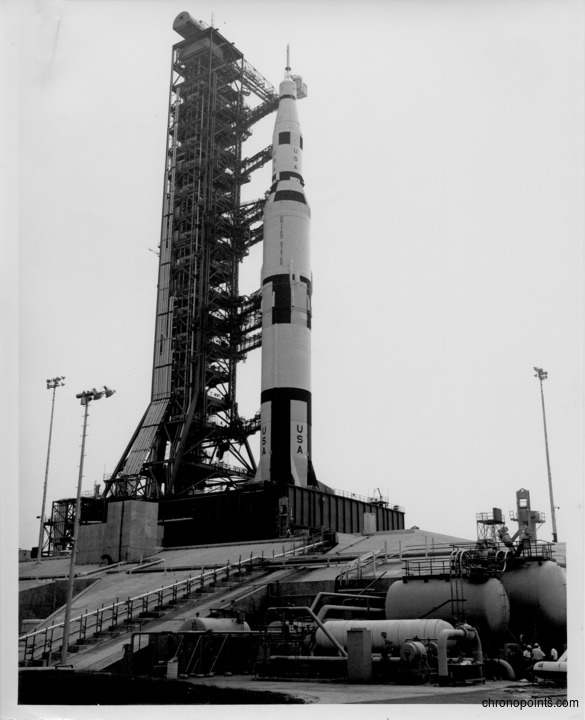 Before rolling a functional Apollo-Saturn launch vehicle, the National Aeronautics and Space Administration (NASA) used a full-scale mock up made from "boilerplate" parts to test assembly and rolling the rocket to the pad. SA-500F also was used for a propellant transfer "wet" test although the rocket was inert. The foreground of the photograph shows the propellant tank farm and water pressure systems. Original black and white photographic print, June 28, 1966: Private Collection of Dr. Calvin D. Fowler. Digital reproduction of original black and white photographic print, June 28, 1966. "500-F-A Dress Rehearsal." National Aeronautics and Space Administration. 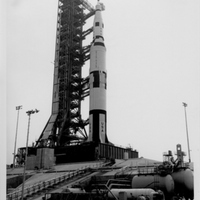 http://www.hq.nasa.gov/office/pao/History/SP-4204/ch15-4.html. “SA-500F Full-Scale Saturn V Mock Up at John F. Kennedy Space Center Launch Complex 39A.” RICHES of Central Florida accessed April 20, 2019, https://richesmi.cah.ucf.edu/omeka/items/show/5018.